This book stays true to it’s own lessons. A clear and concise message with a rigid format which has something for newbies and seasoned pros albeit Americanised. Documentation for Rehabilitation. 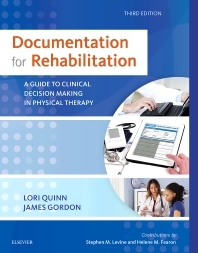 A Guide to Clinical Decision Making in Physical Therapy is aimed towards rehabilitation professionals who would like to improve their skills in documenting rehab plans and evidencing their clinical reasoning. On the whole it is easily accessible, easy to follow and easy to use with enough complexity to cater for all needs. The fundamentals of the book are based on the ICF framework which is the WHO framework for measuring health and disability at both individual and population levels. ICF was officially endorsed by all 191 WHO Member States in the Fifty-fourth World Health Assembly in 2001 as the international standard to describe and measure health and disability. The fact this book is based upon the ICF framework means it is a sound choice for those wishing to improve their rehabilitation provision in keeping with the Rehabilitation 2030: A Call for Action. Split into two sections, firstly the Key Aspects of Clinical Documentation and secondly Documenting the Initial Evaluation and Beyond: A Case-Based Guide, the book follows a clear structure which optimises your learning. You learn the basics in section one and apply them in section two. Section one includes; ICF framework, essentials of documentation, legal aspects, standardised OMs, payment policy and coding and the electronic MR. Section two includes practical guides to documenting each of the following; referrals, activities, impairments, summary and diagnosis, goals, plan of care, SOAP and modified SOAP notes, special formats, and in pediatrics. The ICF is woven into the fabric of the text. The book is ideal for those who are learning how to apply the ICF to their practice as there are plenty of questions and tasks at the end of each chapter. This means that the lessons you learn here can be directly applied to your clinical practice. As always mentioned in physiospot, clinical significance is king and this is the major strength of this book. The book has something for everyone. 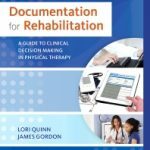 For newbies, the book provides a deep and rich understanding of why documentation needs to contain clinical reasoning and a clear plan. For seasoned pros, it provides a clear recap of the fundamentals, an opportunity to polish the finer details, an introduction to the legal aspect of documentation as well as some tips with how to teach juniors the correct approach to documentation. The main philosophical idea underlying this textbook is simple: not only the logic of clinical reasoning reflected in documentation, but documentation itself shapes the process of clinical reasoning. Preface ix. In terms of appearance it is a little bland, with black text on a white background and the occasional blue textbox to break it up. This doesn’t take away from the messages within, but more colour might make the book appealing to those who deem this topic to be bland. Even though it has a bland look to it, it is plenty durable. The plastic covering survived a dousing of honey as well as a wipe down; kudos Elsevier, longevity is a plus here. This is important when you spend $50 on a book!